PMI data for February show the services sector is firming in the EMU and in three of the four largest EMU members. China shows services sector deterioration and flips the switch on sector weakness and strength. In the EMU, both manufacturing and services are weak with four-year rankings in the bottom ten percentile of their historic queue of data for both manufacturing and services. In China, while both PMI gauges are close to 50 on the diffusion scale, the manufacturing gauge is still in its 40th percentile. In the EMU, only France has a standing that high. 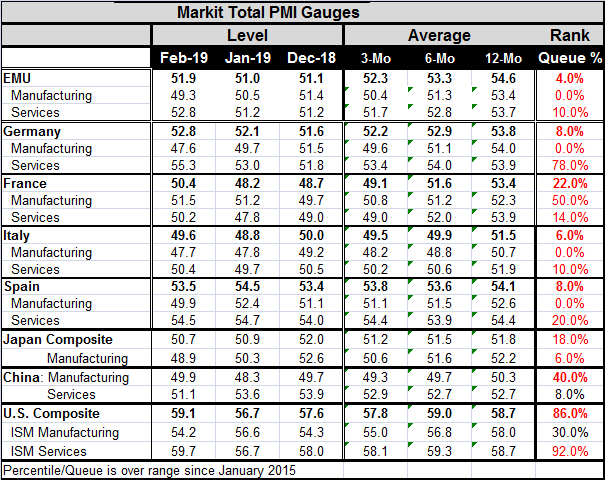 However, the China/France manufacturing PMI gauge standing is not a reflection of relative strength. It is instead a statistical admission that manufacturing in France and China has been weaker all throughout the past four-year period. Percentile standings only evaluate a current diffusion metric relative to its own history and Markit provides just bit more than four years of data for nonspecialized data-bases. The rebound in the composite and services PMI gauges this month is still not enough to reverse the ongoing slid in the PMI averages. For the most part, the composite PMI one-year averages are stronger than the six-month averages, which, in turn, are stronger than the three-month averages. Spain is an exception to this. Spain is also an exception to the finding that the current month composite PMI is stronger than the three-month average. And for manufacturing, the PMI averages also show step-wise declines like the composite PMI, but manufacturing also generally shows a weaker February value than its three-month value. France and China are exceptions to this trend. What these trends tell us is that the services sector is beginning to resist further declines while manufacturing is continuing to weaken and in many (most!) cases manufacturing PMIs for February are showing outright manufacturing sector declines. France and China are the exceptions. The PMI data do map into the industrial output data. For the EMU, both IP and manufacturing PMI data point to declines in the manufacturing sector. There are fewer double checks on service sector data. And services more rarely show declines. But the rankings of the service sector PMIs confirm that there is still a great deal of weakness in services compared to past standards. A curve ball from the U.S. This month the U.S. sets patterns all its own. It does not repeat the declining moving average pattern for PMI gauges except in manufacturing. And the U.S. manufacturing PMI does continue to be weaker than its three-month average. But on the services (nonmanufacturing) side, the U.S. gauge shows no clear trend. And in February, the U.S. nonmanufacturing PMI is up strongly, so strongly that it exceeds its three-month average, six-month average, and 12-month average. The service sector ranking shoots to its 92nd percentile on this timeline as the U.S. service sector gauge jumps to its strongest reading in three months. The U.S. is on board with the global trend for manufacturing that reveals global deterioration. But whereas service sectors globally have shown some firming, the U.S. services sector shows strengthening and outright strength. It is a difference that is more than just a subtle one. And while a number of U.S. reports including regional Federal Reserve Bank nonmanufacturing sector gauges have been weakening, the nationwide service sector gauge spins a completely different tale and that begins to lay the groundwork for a Federal Reserve policy conundrum...coming soon?